Obama’s State of the Union Pushes Green, but Will Congress Budge? At Inhabitat we often wonder, with so much great green technology out there, why are we so far behind other countries in renewable energy? Gearing up to watch Obama’s State of the Union Address last night I was hoping for a bit of an explanation. Last night, as it is becoming ever apparent in US politics, the divide between the parties was distinct and almost unchanged throughout and Obama agreed that this partisanship might very well be what is holding our country back. 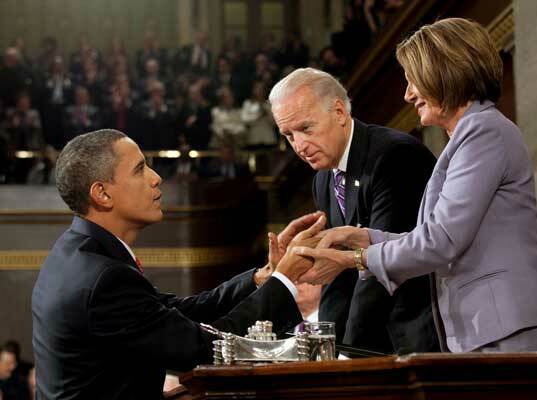 Along with a promise to provide more tax cuts for energy efficient renovations, funding for “clean energy” research–no, not renewable energy, we’ll get to that–and the creation of jobs in the “clean energy” field, Obama took a moment to address both parties sitting in the chamber to ask them in his best authoritative tone to quit the bickering. He looked to Democrats and Republicans alike to say, “Of course, none of these reforms will even happen if we don’t also reform how we work with one another…We can’t wage a perpetual campaign where the only goal is to see who can get the most embarrassing headlines about the other side – a belief that if you lose, I win.” Unfortunately the energy bill that we are waiting for falls right into this party divide, and Obama knows as we do that with the current state of division the bill is going nowhere. There Obama took a moment to note something we’ve heard San Francisco Mayor Gavin Newsom say, “I know that there are those who disagree with the overwhelming scientific evidence on climate change. But here’s the thing — even if you doubt the evidence, providing incentives for energy-efficiency and clean energy are the right thing to do for our future -– because the nation that leads the clean energy economy will be the nation that leads the global economy.” He noted that investment in clean energy is investment in new jobs and new jobs are what we need to keep our economy on the upswing. Clean energy gives us the opportunity to hearken back to the glory days when our factories were humming and our exports were abundant. His tone was so much more economic than it was environmental and that was a smart strategic move. We’ve got the environmentalists – now we need everyone else on board. Though his effort to swing the green energy movement across the party lines was valiant, we have a bone to pick with his verbiage. He mentioned clean coal, natural gas and offshore drilling as sources of “clean energy” and we have to note that we’d rather have those statements replaced with wind farms and solar plants. The mining of coal, offshore drilling and natural gas removal are still environmentally destructive practices. Though we know much of the recovery act money went to great green efforts like the high speed rail in Florida, we hate to hinge even a part of our new energy strategy on old destructive energy practices. If the subsidies and tax breaks now given to the oil companies are shifted to solar manufacturing development, this sector will take off. Rooftop solar is the key. Residents and small businesses will both benefit. The extra $3-400 dollars that each resident and small business saves each month on their power bill will go back into the economy. The trick is not to let the utility companies step in and "meter the sun". With electric car production taking off as it is, the solar energy used for the average resident and small business to charge the batteries will result in further savings. The new factories manufacturing solar and electric cars are using solar for power and a large dose of robotics. These blended technologies will help the US stay competetive with the Chinese. I agree fully that the next step in the fight for clean, renewable energy is an economic argument. You can talk all day about carbon neutral this or carbon tax that but until you show the average person how in the long run this will save them money, and create a vibrant economy no one will be on board. And until we start investing large amounts of money into expanding green tech, making it more efficient, and cheaper no government world wide will agree to any effective carbon cutting plan. Obama's State of the Union Pushes Green, but Will Congress Budge? At Inhabitat we often wonder, with so much great green technology out there, why are we so far behind other countries in renewable energy? 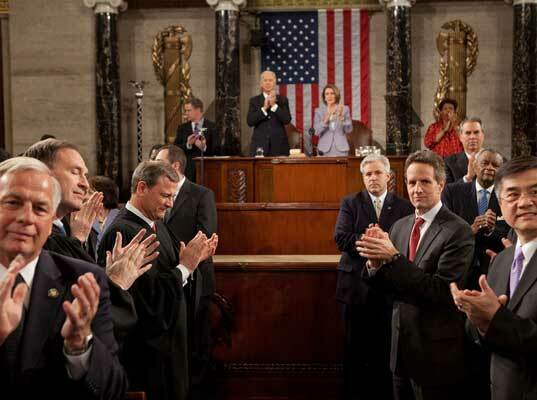 Gearing up to watch Obama's State of the Union Address last night I was hoping for a bit of an explanation. Last night, as it is becoming ever apparent in US politics, the divide between the parties was distinct and almost unchanged throughout and Obama agreed that this partisanship might very well be what is holding our country back.